Yesterday my family and I (or was it me and my family) took a walk at Eloise Butler Wildflower Garden. Here's some of what we saw, presented somewhat in the order we came across them. A Double petaled Bloodroot flower. I think it might be the first wildflower to bloom in the Twin Cities area (wildflower, so I'm not counting trees and garden flowers like daffodils). Rue Anemone. 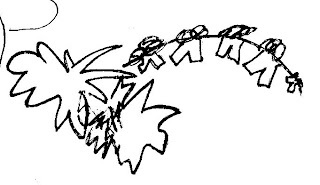 When I mentioned this name to my daughters they wondered why it was named after a sea anemone. It's actually the other way around I think, Sea Anemones are named after flowers. 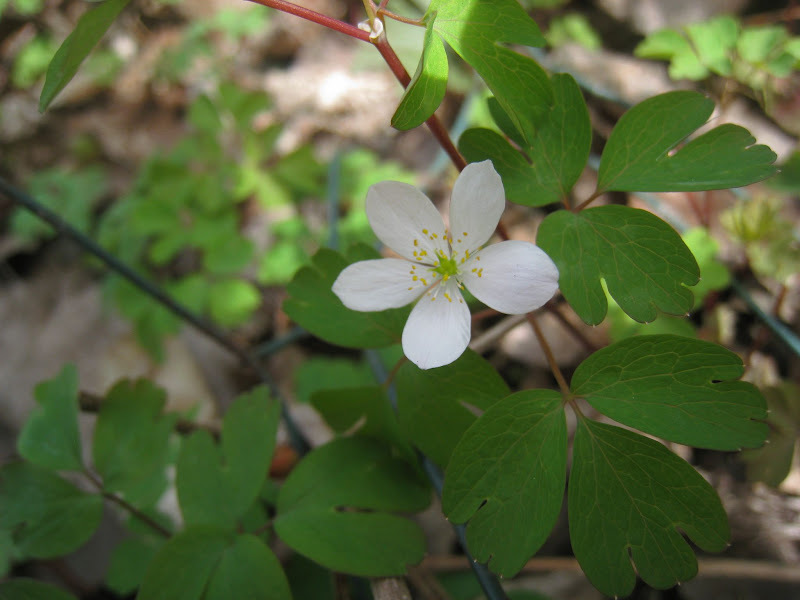 The flowers of Rue Anemone resemble those found in the related genus Anemone. Both are in the buttercup family (Ranunculaceae). The rue part of the name refers to the fact that the leaves of Rue Anemone resemble those of the unrelated Rue. Sort of confusing if you try to keep it straight, which you don't have to do to enjoy them. Speaking of confusion, Pictured here is False Rue Anemone. So it resembles the Rue Anemone, and is named after it, which, as mentioned above resembles and is named after two other flowers. In my experience, people can't keep the two straight. They certainly resemble one another, but I wonder if it has to do with the similar names too. I think they are pretty easy to tell apart, but if you ask me why I don't have a good answer, other than False Rue Anemone tends to be more clumpy. Look it up in a filed guide for a more technical answer. And to make the name thing more confusing, False Rue Anemone is often called Isopryum, which used to make sense, because it was in the genus Isopryum, but some time in recent history it's been moved to the genus Enemion. And by the way, I hate typing the word "Anemone" for some reason. Wake Robin, or Purple Trillium. 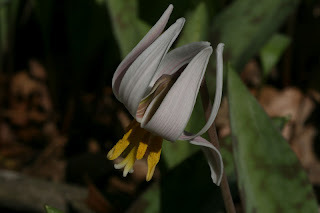 And White Trout Lily. There is a third trout lily, the Dwarf Trout Lily, that is only found in Minnesota, and only a couple of spots in Minnesota at that. I believe it is the only endemic (found only here) in Minnesota. So if you know a Boy Scout here and they are working on their Naturalist Badge, you can let them know that to fulfill requirement #11 they'll have to look up the Dwarf Trout Lily. Here's a plant name that makes whose common name and scientific name not only make clear sense, but mean the same thing. Hepatica comes from hepatic, having to do with the lives, and refers to the fact that the leaves are divided into three lobes, like a kidney. The species name, acutiloba, refers to the fact that the lobes of each leaf are pointed, or acute. 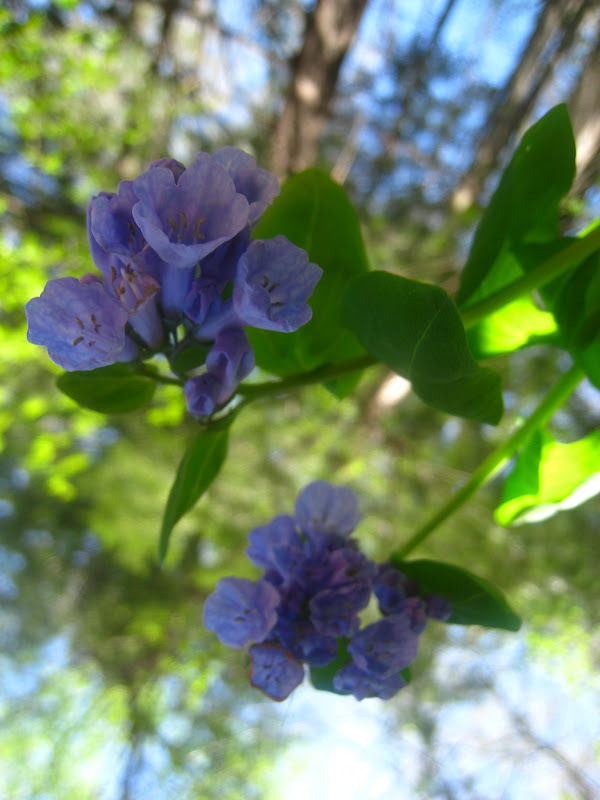 Slug-eye view of Virginia Bluebells. Another slug-eyed view. Actually I have yet to see a slug this spring, and my garden is full of them. Adele smelling a Skunk Cabbage. Moving away from the wildflower theme with a picture of a Tamarack cone. I was hoping to convey some of the soft greeness of the young needles along with the cone. The trees are standing up. in the summer in 2's and 3's. Oh, oh how beautiful it is. 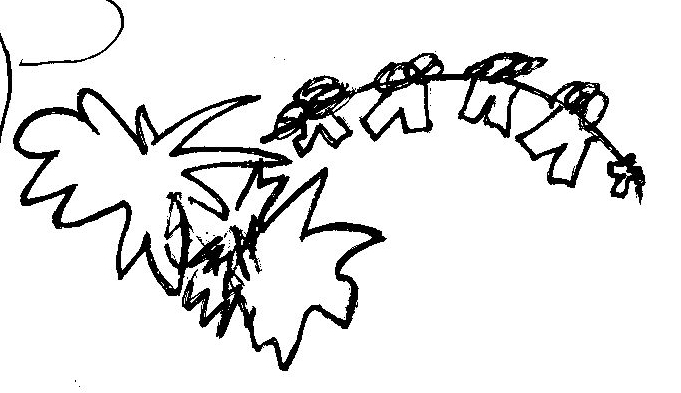 Naomi (age 6) was sketching the entire time. Here's here picture of Dutchman's Breeches.